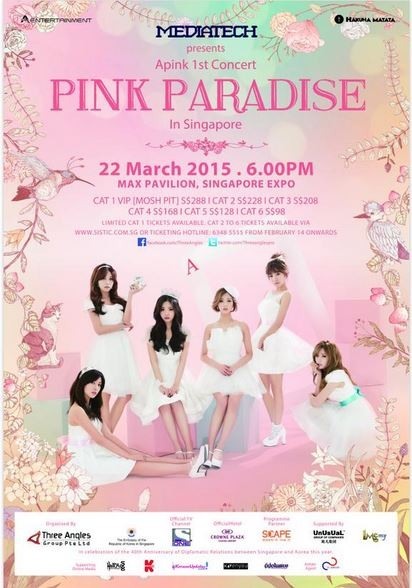 K-pop girl group Apink will hold an exclusive concert in Singapore in late March. Singapore is the first destination for the sextet’s overseas concert “APINK PINK PARADISE,” which will take place on March 22 at the Max Pavilion in the southeastern Asia. The band’s first-ever concert, held in Seoul on Jan. 30-31, was a big hit, with some 7000 tickets sold out within 2 minutes of going on sale. Apink has seen its popularity grow across Asia, especially in Japan. It nabbed the No.2 spot on Japan’s Oricon weekly music chart with its second Japanese EP “Mr. Chu” in the first week of its release in February. It will also drop a Japanese version of its album “LUV” and perform the track for the first time at “Girls Award 2015 Spring/ Summer” in Tokyo on April 29.